WASHINGTON (CNS) — After almost 12 years as an Episcopal priest, Deacon Jonathan Erdman entered into full communion with the Catholic Church along with his family in 2016 and a year later, he is becoming a Catholic priest. He will be ordained a priest of the Personal Ordinariate of the Chair of St. Peter June 29. This spring, 590 men entered the priesthood in dioceses throughout the United States, according to a report released by the U.S. Conference of Catholic Bishops in Washington. The report is based on an annual study that the Center for Applied Research in the Apostolate conducted for the USCCB. Leading to his joining the Catholic Church, Deacon Erdman felt something in the background repeatedly calling him to the church, but he said he continually found new ways to distract himself. He recalls teaching a yearly presentation on “What Is the Episcopal Church?” at St. Meinrad Archabbey and Seminary in Indiana. “One of my students joked that it seemed I wanted to be a bit more Catholic with each passing year,” Deacon Erdman said. Events such as the election of Pope Francis allowed Deacon Erdman to see the unity of the Catholic Church through devotion and prayer, gradually leading him to the doors of the Catholic faith. The first time Deacon Erdman attended Mass while beginning the discernment process, it happened to be on the feast of the Chair of St. Peter, the namesake feast of the ordinariate of which he will soon become a part. Based in Houston, the Personal Ordinariate of the Chair of St. Peter is similar to a diocese, but national in scope. It was established in 2012 by the Vatican earlier this year to facilitate and shepherd communities of former Anglicans wishing to join the Catholic faith while retaining elements of their Anglican heritage and traditions. After his priestly ordination, he will serve the Community of Our Lady and St. John in Louisville, Kentucky. Six months after Father Andrew Dawson entered the Catholic Church at Easter 2006, people began to ask him if he had thought about joining the priesthood. 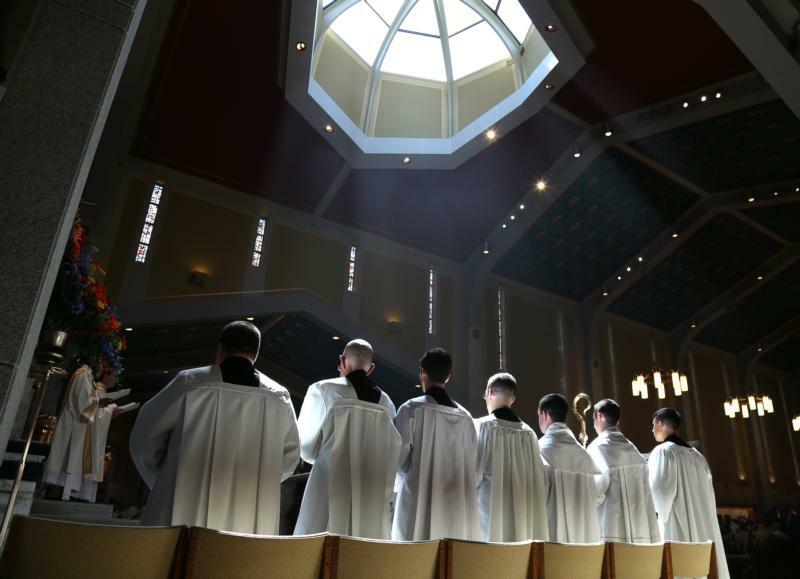 According to the USCCB report on the ordinand class of 2017, 87 percent of men were encouraged by an average of four people to enter the priesthood. The priesthood eventually became all that Father Dawson would think of in his free time. Before entering the seminary, Father Dawson worked as an associate director at a Catholic youth camp, Sancta Maria, in Gaylord, Michigan. His experience working at the camp drastically influenced his faith life, as the camp began his intellectual conversion to the Catholic Church. Father Andrew said he relates to St. Peter because of how St. Peter is both bold and terrified, both understands and doesn’t understand, how St. Peter puts all his weaknesses out there and still the Lord uses him in a powerful way because of his openness. Being in the Archdiocese of Detroit also has brought Father Dawson close to the late Capuchin Father Solanus Casey, who will be beatified in Detroit in 2017. Father Dawson wore a relic of Father Casey during his ordination and will serve at St. Fabian Parish in Farmington Hills, Michigan. Father Steven Oetjen’s parents, along with those of 80 percent of the new ordinands, were both Catholic. They raised Father Oetjen and his siblings in the church, sending them to Catholic schools and Mass every Sunday. But it wasn’t until Father Oetjen went off to study engineering at Carnegie Mellon University in Pittsburgh that he began to feel the call to the priesthood. Desiring to make his faith his own, Father Oetjen became involved actively with the Newman Center at Carnegie Mellon and he saw in his friends a joy in living a life of virtue that he, too, wanted for himself. It was in the chapel at the Newman Center that he encountered the Blessed Sacrament. This devotion to the Blessed Sacrament eventually revealed a little tug on his heart that Father Oetjen felt and discovered to be God calling him to the priesthood. Like 43 percent of those ordained this year, Father Oejten finished his undergraduate degree before entering the seminary. Father Oejten was ordained June 10 in the Diocese of Arlington, and he will serve at St. James Catholic Church in Falls Church, Virginia.